Welcome to the largest collection of news, facts, data, photographs and links on the islands of Leyte and Samar in the Web! Since this is a relatively new site (less than a month old!) please visit the Frequently Asked Questions (FAQ) page for more information on what these pages are all about. Delve into the pages and explore! Have fun! Looking for data/facts/news on the Republic of the Philippines? These are NOT the pages! Please visit the links section for outside links. 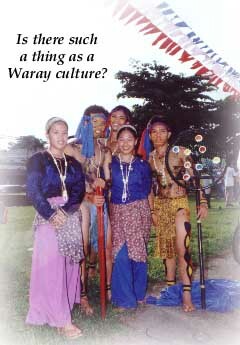 Is there such a thing as a Waray culture? news on Eastern Visayas? Join our mailing list!